← What Would My Father Think? I can’t help it. Once again, I found myself talking to someone about a book and saying “Oh that’s my favorite book!” And, of course, it’s one of my favorite books. In October, I posted My List of Favorite Book and realized that I couldn’t possibly list every book that I loved. Perhaps I should just write a list of books I’ve read more than 5 times. Before I get to the actual list, I want to ask if anyone is reading Ready Player One by Ernest Cline? My son suggested it and I really like it. I don’t love it yet, but I may. Excellent sci-fi, which is very hard to find. This book has won several awards and Spielberg is coming out with the movie which is slated to be his best yet. But it is filled with trivia about the 1980’s. Not my favorite decade, so some of it I’m not familiar with. But definitely will keep reading it. If I find myself wondering what is going to happen next in a book, it’s a keeper. Click here for Goodreads description. So now to my actual list. As only Simon Winchester can do, this book reads like fiction but is a true story. Absolutely fascinating and I’ve read it at least twice…….. Now I want to read it again. 3. I can’t believe in my October post I totally left out Charles Dickens. I inherited this beautiful set of Dickens books. Oddly, I have read only 3 of them. Christmas Stories, Oliver Twist and Pickwick Papers. I also love Great Expectations and A Tale of Two Cities. I think that only a sadist would read Bleak House, but maybe you have to be a lawyer to appreciate it. But I’m sure some of you loved that one, too. 4. I’m cheating a little here because I had Winnie the Pooh on my October list. But I’m including it here because I have 2 great copies of it. 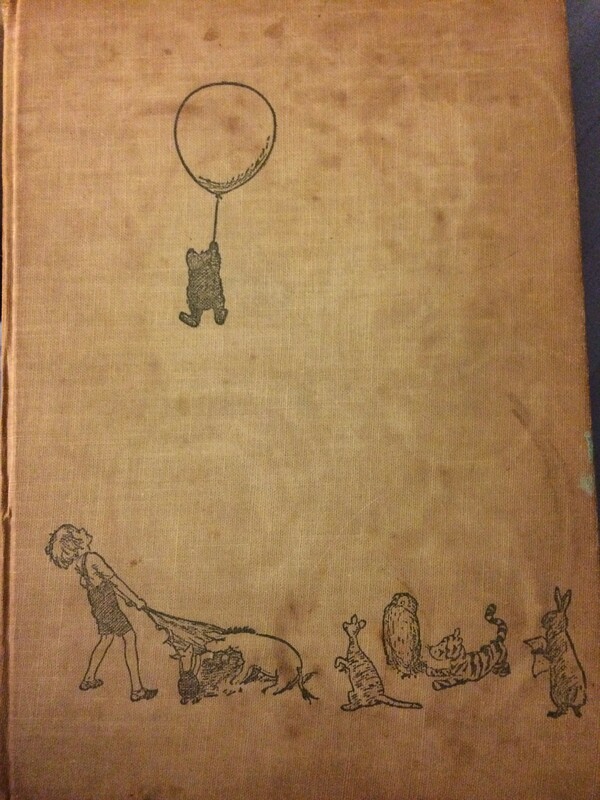 This older copy of Winnie the Pooh by A. A. Milne was published in 1948 and has wonderful illustrations. My parents bought it in London for my brother and inscribed it in 1949. I was yet to be a twinkle in their eyes. 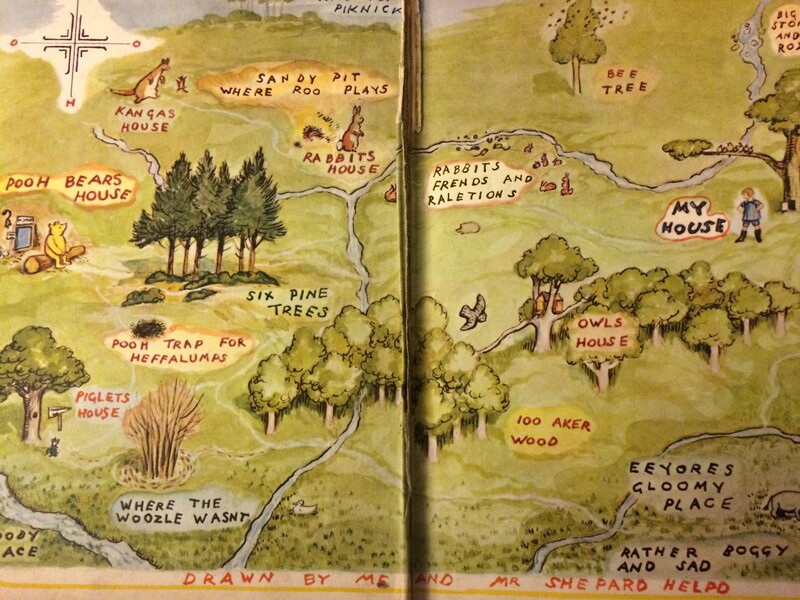 My other copy is The World of Pooh and was published in 1957. This also has wonderful illustrations, although the cover has really taken a beating. Fully equipped with evidence of a mouse having chewed the upper right corner. So quaint, but if I saw a mouse now I’d be running screaming out of my house. 5. I’m going to end with Tess of the D’Urbervilles by Thomas Hardy. Now, this is absolutely my favorite book. Ooops. Well, ok, not. But one of them. It’s definitely time to read this again. My list of my favorite book…..the sequel. Stay tuned for the prequel. This entry was posted in books, Uncategorized and tagged A. A. Milne, blogging, books, charles dickens, Ernest Cline, literature, opinion, pleasure, reading, Simon Winchester, thomas hardy. Bookmark the permalink. My list changes frequently, but there are always those books that come first to mind when people ask for my favorites. But I don’t read many classics, and the ones I read were long ago so they tend not to make my list. The first ones that come to mind for me are “A Fine Balance”, “Memoirs of a Geisha,” and “Midwives.” Loved those books. I loved Memoirs of a Geisha as well. Usually the books I think of as my favorites, and the ones I read the most are current detective books and mystery books. Also, I like a lot of Young Adult fiction. Like The Hunger Games. I read that for work but find that a lot of YA books are more interesting than books theoretically aimed towards an older audience. But I’ve started back to the classics because they are like old friends. I was introduced to them in high school and college and they are a part of many good memories for me. Thanks for your comments. I always love to hear from you. What I don’t really like is literary fiction that is modern. And now that I just said that titles are popping into my head that I do like. I guess I like almost every genre. Except westerns. But I don’t actually know if I’ve ever read them. Give me a good Jack Reacher or Harry Bosch novel any day. And that shows how much I like them. I know the characters better than the authors. Sue Grafton’s, Jo Nesbo’s, Jussi Adler-Olsen’s, and Robert Galbraith’s (JK Rowling’s) series are my favs. Robert B. Parker who, luckily for us, is still publishing even though he passed away. Haven’t read his yet, believe it or not, but my high school son has a book of his I think. Prolific writer with three, I think, detective series. So good. Quick reads, plot driven, really enjoyable and with some humor. I was so upset when Parker died so suddenly. The medical thriller world lost Michael Palmer last year, too. I met him in person twice. Such a nice guy. Do I know him? Not personally, lol, but I have to look him up. I like medical mysteries and true crime, too. Oh of course I know him. I’ll have to read more. Thank you. When I think of the hundreds of books we had in the cottage, there weren’t that many authors! Hubby liked Jack Higgins, and then suddenly he didn’t. We had all of Matthew Reilly’s (he hasn’t written anything for a few years now) and my comments on Lee Child are plentiful, having not bothered with his latest two offerings. I have just finished the latest David Baldacci book (someone else I had the complete ‘set’ of), and I was really disappointed. My tastes have changed, so I thought I’d read some classics by Jane Austin, and couldn’t get into those either. I did enjoy Dances with Wolves and The Abyss though. We had both on special edition video which went back to the book and were much better than the original cinema releases. I love David Baldacci and Lee Child. I have never been able to stand Jane Eyre. And I’ve tried at various times of my life. I think so much depends on my mood, too. I’ve read Ready Player One, and sometimes I feel like the only person in the world who was not a fan. -.- I didn’t HATE it, mind you, I just didn’t think it was worth going gaga over. That’s about my feeling, but I’m probably more up the liking scale than you are. I got completely caught up in a couple of chapters and then not so much in others. Usually I can’t put a book down, although I am a little slower with non-fiction. But Ready Player One isn’t calling me in the same way. Thank you for commenting. I enjoy “speaking” with you, because I think that you and I have much in common with literature. And when we disagree, we can have a lively discussion. I maintain part of my problem with Ready Player One may have been my medium for it. I listened to it as an audio book, and Wil Wheaton’s narration did not…thrill…me. To say the least. I grew up mainly with French and Russian authors, and though an avid reader, my knowledge of Engish classics is patchy. Favourites vary over the years, I like to move on: the literature out there nowadays is so multi-cultural and energizing. I love good thrillers and sci-fi, both help me keep up with modern English language and dialogues, and the second offer peeps into where we might all be heading 🙂 I read lots of essays too, am now on “Adventures in the Anthropocene” by Gaia Vince, which is pretty close to sci-fi anyway! I don’t usually read essays, although some memoirs I find fascinating. I’ve read some Russian authors, but few French. I’m seeing a gap, here, in my education. I love the Scandanavian mystery and detective novels that have grabbed ahold of American audiences with excellent translations. I agree they’re good suspense, but sometimes they get a bit too gory for me for comfort! Oh I don’t mind gore. I really don’t. As long as it isn’t gratuitous. OMG I love “Ready Player One.” It is fantastic. I think it would appeal more to a male of my age who grew up playing video games in the 80’s and is still playing them today. Exactly my thought. My son, who will be 29 on Saturday, treated himself to a ps4. He’s the one who recommended it to me. I liked it but didn’t love it. Think I’ll go download some of this, it’s always nice to have some new recommended books. My favourite is Little Women my Louisa May Alcott, have you read it or the series? Yes I have! But not in decades. Good to give a go again.